4HResearch is always interested in hearing from anyone who may wish to contribute information, pictures and particularly at the present time, model making skills. What do model makers do with their personally valuable creations?… sometimes they put them in a display box, sometimes they just go in a cupboard until a few bits get broken and they get chucked! How about putting your work on public display within a 4HR project? No matter if it is kit building, kit bashing or scratch building, ship, aircraft, armour, figures and railway modellers are invited to enquire. If you are interested please email us through the 'CONTACT US'. All contributions to a 4HR exhibition will be acknowledged on the exhibition piece and on this website. Erina Branch of Gosford City Library, May 2012. Small beginnings, Peter Adderley, Peter Rea and Bill Shute with the first three models publicly displayed. The event was the 70th anniversary of the attack on Sydney Harbour by the Imperial Japanese Navy - Eastern Attack Group. The three original models along with anther nine models have now been incorporated in 4HR's first major exhibition 'Submarines Off The Coast' exhibition see our 'Submarine' page. Two 1/72 scale aircraft built straight of the box by Peter Adderely for the display of individual aircraft from Rathmines RAAF Seaplane Base (see our 'Rathmines' page). left: Short Sunderland is awaiting RAAF decals. Right: Constellation PBY (Catalina) built by Peter Adderley complete in 'Black Cat' paint and RAAF markings. 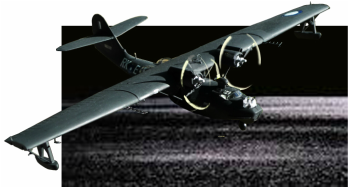 The model was 'photoshopped' by Peter Rea to be flying over a moonlit Pacific with props spinning see our 'Rathmines' page. Above: Michael Evans with some of his scratch built work, Mick built the model of HMAS Swan for 4HR's WWI project. The Swan is currently on loan to Henry Kendall Museum, Henry Kendall Street West Gosford see 'HMAS Parramatta and HMAS Swan' page. NSW History Week, 2014 was on the theme of 'The Great War'. Henry Kendall Cottage and Museum at Gosford organised an appropriate event, with over 100 people attending. 4HR provided the second presenter, with the opening presentation by Professor Richard Waterhouse from NSW History Council. Bob Pankhurst gave the final presentation complete in WWI Australian Light Horse uniform and horse tethered outside fully equipped for a charge at Beersheba. 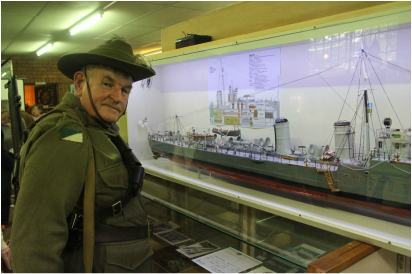 4HR has loan the Mick Evans built model of HMAS Swan to the museum and Bob Pankhurst (above) found the model, of the same period as his uniform, very interesting. 4HR WWI exhibition due for unveiling on 25 April 2015, the 100th centenary of the Anzac participation in the invasion at Gallipoli,Turkey. Rathmines WWII RAAF Seaplane Base - diorama - a number of aircraft and other details are required to complete this large diorama. Air History In The South Pacific - from the Royal Air Corps, R & K Smith’s Vickers Vimey, Kingsford Smith’s Southern Cross to the latest RAAF and RAN aircraft. A history in models is gradually being assembled for this project. No set time has been set to commence displaying this exhibit, it would be desirable to display, at least, some of this story and scale models for the 75th Anniversary in 2017/2018 at the latest. 75th Anniversary Pacific War - Part of the above project we are concentrating on is the period from December 1941- December 1942 in the Pacific and Indian Oceans. The exhibition period will commence in 2017/18. Already in hand are some twenty five scale models from the AIF, IJN, RAN, RAAF, RAF, RN, USN, etc. We are steadly adding to these. West Head Battery - We wish to up-date our model of the inclined railway at this defence installation and any interested railway modellers are invited to contact us. Other Possible Projects - 4HR is always happy to hear from anyone interested in what we are doing. Particularly any prospective contributors, any scale model builders, who may like to have their work publicly displayed are very welcome to enquire, all individual contributors are always acknowledged. Suggestions for other projects that anyone is willing to assist with are welcome. For example a couple of years ago ex-HMAS Adelaide was scuttled off the Central Coast. With that local connection we aim to complete a exhibition of ‘HMAS Adelaide, it's size, protection and armament - compared to other warships ships from other eras’. ‘The WWII North Africa/Greece/Crete Campaigns. To contact us please use the 'Contact Us' form.